I was lucky enough to spend not one, but TWO, gorgeous days in the city – back to back! Monday was Daddy’s last day off for Spring Break, so we *had* to go on an adventure. Since the weather was so beautiful, we packed up Henry and headed off to Central Park. Mommy downloaded an audio walking tour, but we managed to go into the park via the wrong entrance (we couldn’t find the Artists’ Gate), so we couldn’t pick it up. We wandered past the zoo (and waved at the sea lions) and got to the Delacorte Clock just before 1:00pm, to watch the dancing animals. Before we got too settled in the park, though, we wanted to grab some lunch – logistically difficult for two reasons: Henry was with us & it was still Passover. We settled on the Barking Dog Luncheonette, where Mommy and Daddy really enjoyed the salads – I picked off their plates, and gobbled up a green bean, a bit of red pepper, and some avocado. Henry had a great time, too! Oh. And the $500 price tag! Nice Saleslady: This is the double layer eco-dyed organic silk. Mommy: Thanks, but my husband would probably kill me. Nice But Somewhat Deluded Saleslady Who Apparently Works On Commission: Are you sure he would notice?
? Really? Who wouldn’t notice a $500 credit card bill?! Moving on. We finished up in the store and schlepped back over to the park, where I napped and Mommy read and Henry ran and played. I woke up in a slightly grumpy mood, which signaled it was time to head home. and pointed out some of my favorites. We also wandered around Dylan’s Candy Bar for a while before hopping on the subway to window shop in SoHo. It looks like I’m sitting in the tub with all those gumballs, but I’m really sitting on the edge because the sign says “Don’t Touch.” I thought about it though! 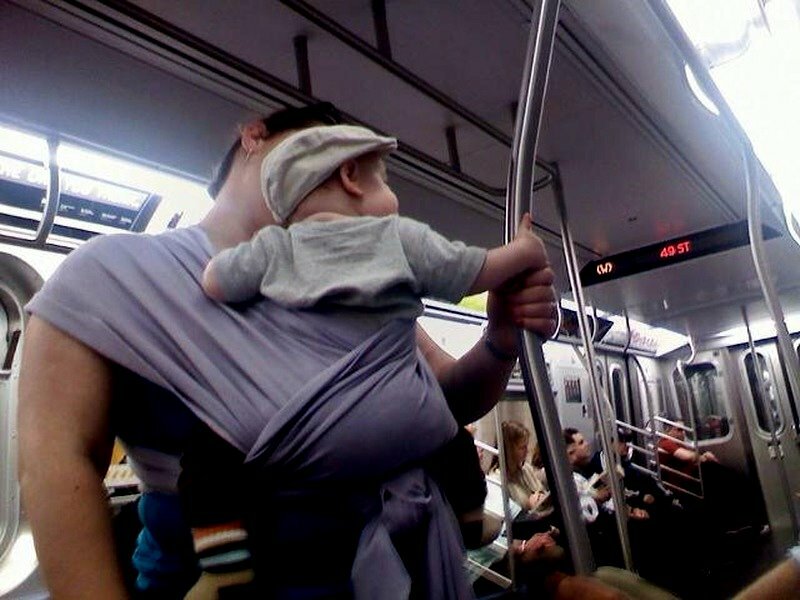 I’m an old pro at the subway by now, and I know you need to hold on tight! I was really tired on the ride back uptown, but I resisted napping and played “Make EVERYONE on the Subway Car Smile At You.” I totally won, too. We got back to the car and headed home, where I fell asleep hanging out and waiting to see Aunt Deb. And, you guys? I slept all the way home, through my diaper change, while Mommy put on my jammies, AND while I ate my bedtime bottle. I did not stir from the time Mommy took me out of the car to when she put me in my crib – I am totally wiped out! Note: If you are headed to an address in Manhattan, make sure your GPS does not think you want to go to Brooklyn. It may or may not have taken us 2 hours to go 30 miles.